We talk a lot about making our homes look fantastic, of imagining our domestic spaces as dream areas full of all the things we've ever wanted, crafted in styles that match our deepest desires and longings. In this discussion, we constantly address the broader elements of the interior design process: how to make a great looking bathroom, how to ensure your kitchen looks fabulous, the best ways to implement colour, and so on. In this, we often forget the specifics and fundamentals: the really important things… like the things that ensure our houses stay robust, the things that make them literally stay up. Of course, we’re talking here about walls. Without walls, you haven’t got much: they’re the crucial element to a home’s design and structural functionality. Yet while having walls is one thing, making the most of them, and making them actually look fantastic internally is another discussion altogether – and a very crucial one. Today on homify, we’re going a step further with walls: our essential guide to transforming your home’s walls from things that are merely robust, into cool, personalised canvasses of interior style. Read on and learn about it. When it comes to your interior walls, there are a range of fantastic devices and tools at your disposal for truly making the most of maximising your walls' potential. 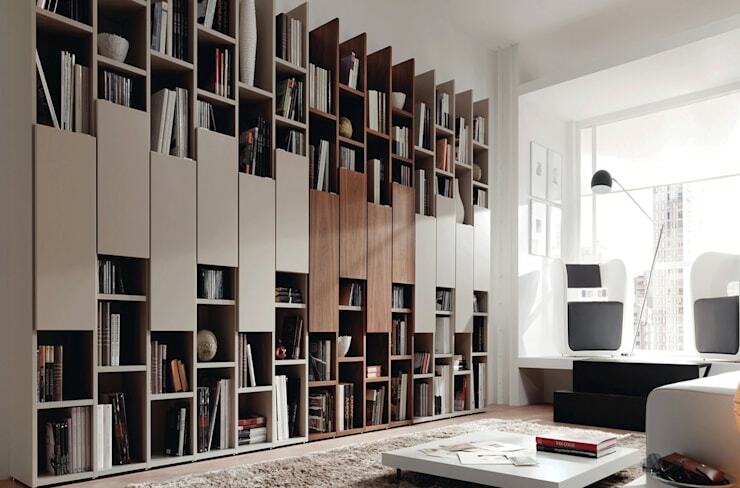 Shelving for example is a crucial area that we ought to pay attention to. Though necessary for holding our books, trinkets and other accoutrements, shelves can also be a cumbersome thing to include in the home décor mix (particularly for homes with limited floor plan). Inserting shelving (and doing it with nous and style) is a real art, and can be a tough thing to achieve with success. Here, we see how shelving is incorporated into the wall itself. By creating a full floor to ceiling setup, the designers have achieved maximum storage space for their paperback titles and miscellaneous storage items. The best thing about this is the way it looks: yes, it's functional, but it actually sings with artistic style. The wooden panels break up the monotony of the 'storage' look, and turn what could be a merely necessary space into one that contributes stylistically as well. 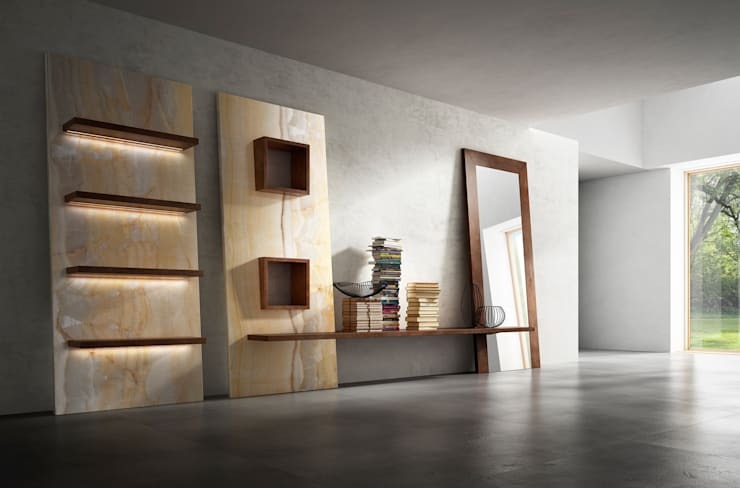 Fuse your storage needs with your wall design dreams and you can end up with something equally striking. Remember when you were a young child and all you ever wanted was a colourful bedroom full of fantasy and interesting things on the walls and ceiling? Perhaps it was your latest favourite film poster, or a series of comic book pages, or whatever else you might have been into that might have just 'looked cool'. They say that getting old is a trap, and we should always stay young where we can—so why not live to those words? Start with paint, and how you use it on your interior walls. In this amazing example, we really gain an insight into the full extent of what's possible with our interior walls. The owner and designers here have decided to stay young, not only by incorporating a fresh lick of paint, but by using that paint to create a truly stunning visual scene! Who knew that an oversized, wall to wall turboprop jet plane could look so dazzling? This is a bedroom that makes a statement. You can do the same with yours: plane, or otherwise. Get your imagination firing, channel your inner child, and get moving on something equally fabulous for your own interior space. Of course, it can be tricky knowing how to go about using the right paint and painted motifs in the home—for a little extra inspiration or advice, why not contact a professional? We're ultra fond of fantastic lighting here at homify, and we particularly understand the importance of lighting in the context of creating great looking walls. Sometimes, with certain treatment like paint and storage, walls won't need too much attention when it comes to lighting. But sometimes, particularly with more sparse wall areas, lighting can be absolutely crucial. Take this fine example on board: simplicity is always cool, and it certainly rings true here. Fabulous stripped back concrete walls, mirroring the warehouse floor, look stealthily chic in this multi-purpose living space. The Minimalist angle is always a great choice. But this thing that makes these walls look even better is the mix of lighting that the designers have chosen. The natural flow of light coming in from the eastern window is crucial, reflecting humbly off the standing wood-framed feature window. Yet it's the fusion of this light with the artificial strip lights beneath the four-fold shelving unit that turns these walls into something truly striking. You don't even need to place anything in their hold: the shelves stand alone as design points, and by virtue of them, so do the walls. Everyone seems to want to have a tattoo these days—from small and out of the way etchings, to bold and brash sleeves full of colour and flourish. In some ways, 'not having a tattoo' is the new having a tattoo. But not quite (and not when it comes to interior design, it seems!) As on the flesh, so too in the home: today, designers have been keeping up with fashion trends by incorporating 'tattoo design' on the walls of their homes too. 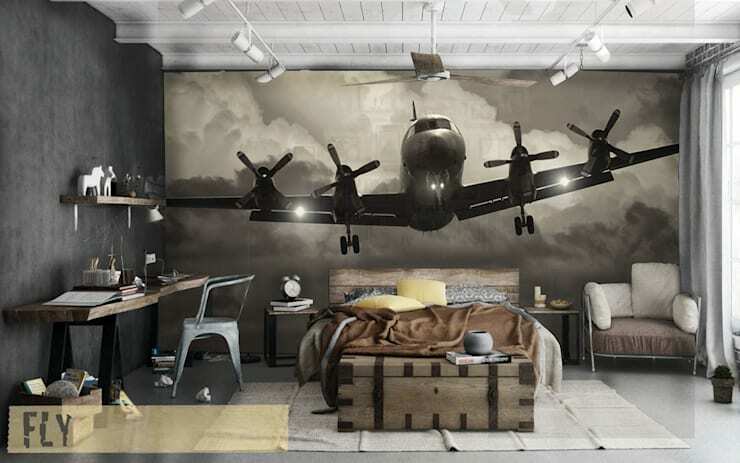 Wall tattoos are a great way of expressing style and points of interest without committing to a full feature paint setup (which can be costly, time consuming, and a real commitment). 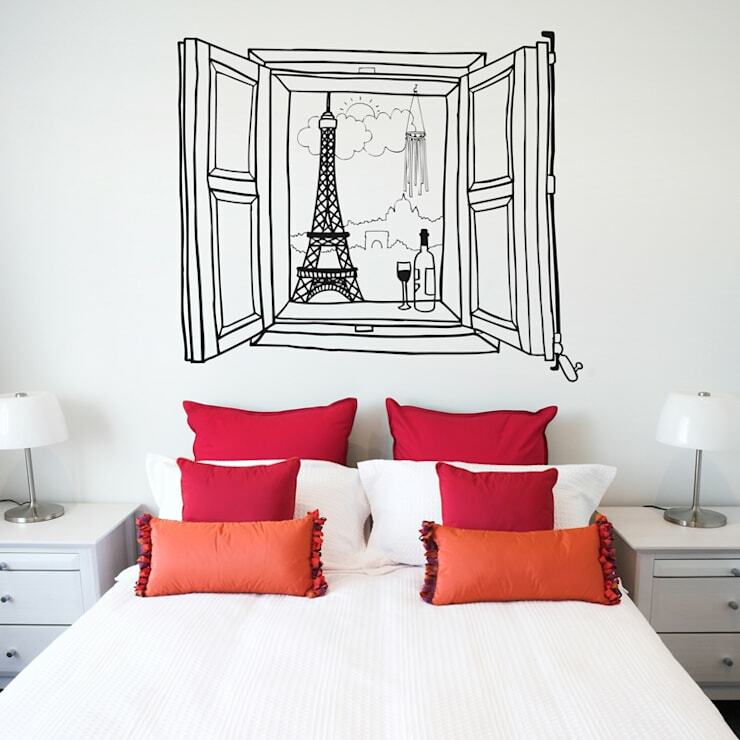 Here, a neat and ultra cute wall tattoo turns this bedroom from a basic, clean and classic configuration into a faux-Parisian joy. Can't get to Paris? Bring the Eiffel Tower to you—or any landmark, vision, or image you care for the most. Lovely! Curios and wall hangings are a great way to add a little charm and character to the walls on your home. 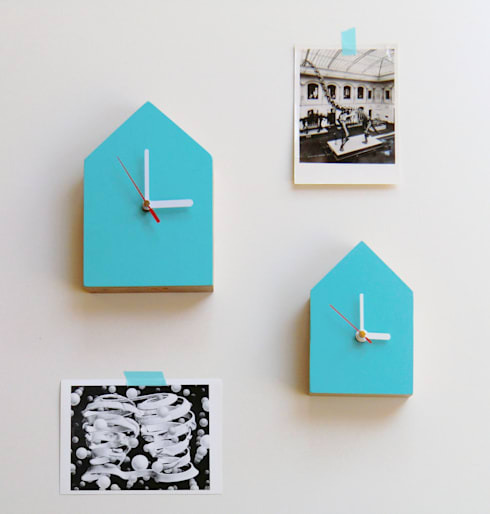 Consider minutature clocks, classic black and white pictures, or various bits and pieces easily found in your local vintage market or store. Here on this cute example, those very elements work to a tee: something simple, and so achievable. Finally, why not think about infusing your space with some fresh, or vintage prints? Hanging pictures, tapestries, and various other framed points of interest can really induce a sense of spark and imagination to a wall area. 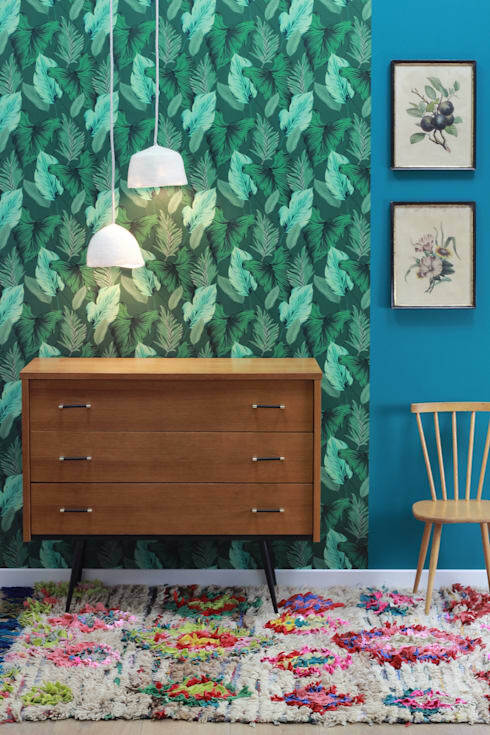 Here, in this cute bedroom space, prints make all the difference, fusing with the printed wallpaper of lush green jungle, and the well positioned lamps. Get your print on, and make your walls look truly cool! Did you like that Ideabook? Why not delve even deeper into the world of walls with a look at how to create dramatic and bold interiors. Do you have any other handy tips for our readers? We’d love to hear from you in the comments section below!